Let us help you close those open permits that are keeping you from selling or refinancing your property. We do everything from new builds, renovations, and repairs! See below for some examples of our work. For our gallery on Kitchens, click here. For our gallery on Baths, click here. 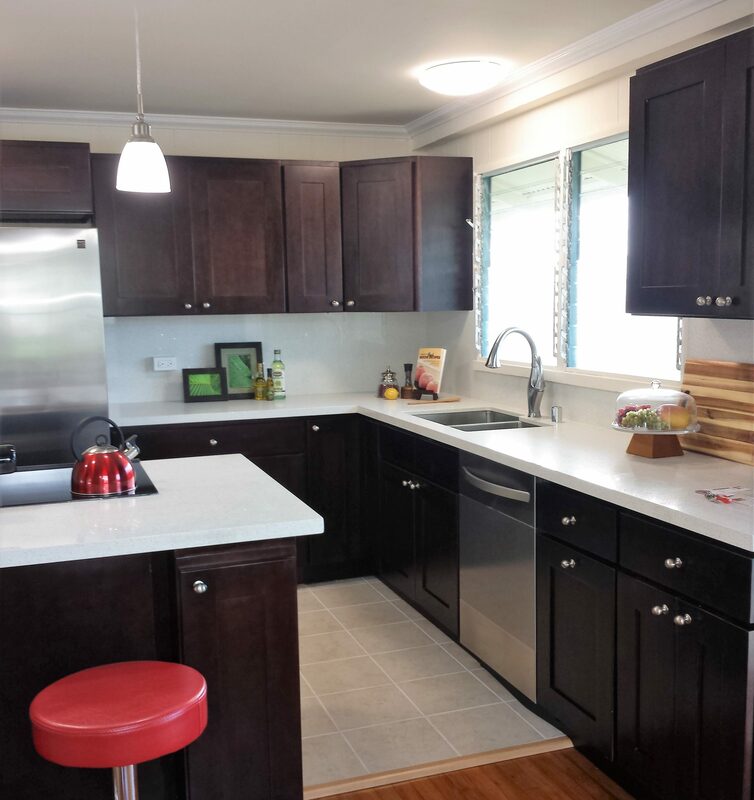 In our Ilima project, we renovated the entire house. In the living room, we removed an archway to open up the space between the dining room and living room. This is a deck renovation. Termites had infested the structural integrity of the beams. We treated for live termites and changed out compromised material then added composite decking for durability. This roof was damaged by a large tree that fell on this house during high winds. The tree was so tall that it caused damage to both sides of the roof. The larger photo shows the house after the repairs were made. The owner wanted to regrade the driveway as there was often many pools and mud when it rained which created more damage to the driveway. We widened the driveway and regraded it so that the water ran off the property towards the right side and covered it with cinder to alleviate the muddiness during rain. For a quick makeover, we installed laminate floors in a dining area where teak parquet had been installed years ago. The tiles were peeling off in some places. So, we removed the entire dining area and replaced with laminate oak flooring. Here are the “Before” and “After” photos. We remodeled an extension for the client with all new roofing, drywall, and flooring.